What you learn through music you don't forget! 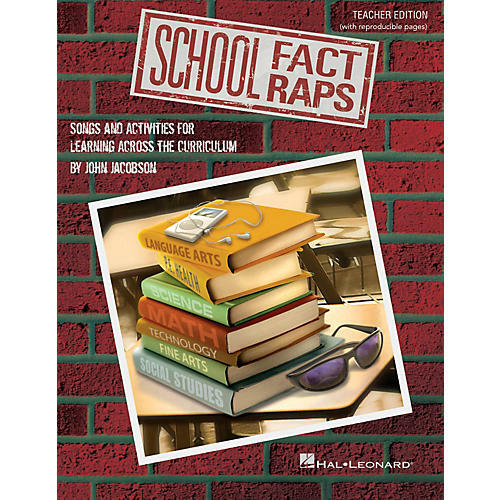 School Fact Raps uses this most effective tool to teach facts across the curriculum in a way that is enjoyable and fun! Learn about polygon and decagon, simile and metaphor, herbivore and carnivore, the continents, character development on sharing and taking responsibility for protecting our world, how to sit at a computer, the basics of music (of course) and much more! Your students will soon be singing through their standardized tests with flying colors, and perhaps a little choreography to boot! In addition to reproducible raps with choreography, the Teacher Edition also includes helpful teacher tips to make the learning process for effective, additional fun facts and extension activities in a variety of subject areas, and some programming and staging ideas. The separate CD recording provides performance recordings to help students learn the songs, and hip accompaniment tracks to showcase your students once they have mastered the raps! Score BIG points with administrators, classroom teachers and parents! Available separately: Teacher Edition (with reproducible singer pages), Performance/Accompaniment CD, Classroom Kit (Teacher and P/A CD). Suggested for grades 3-5.